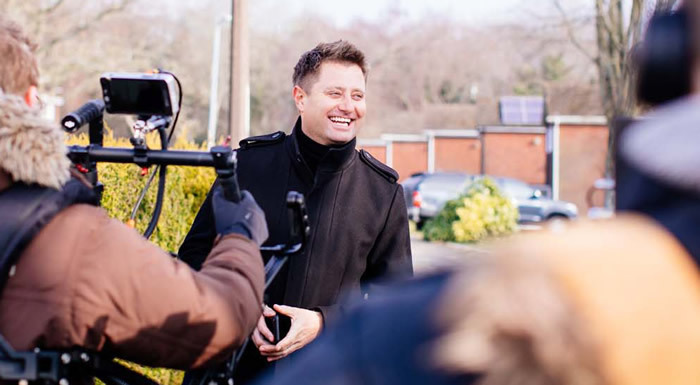 “It’s incredible!” That was the verdict of architect and property expert George Clarke when he got a sneak preview of Truedor’s new factory in South Wales late last month. George, who has been product ambassador for Truedor for the past three years, was given a behind the scenes tour of the ultra-modern production facility in Oakdale by the Truedor team. “The level of investment and commitment from the owners of the business is a big, bold statement. It is great for the area and for all stakeholders in the business – employees, customers and supply chain partners”. George spent two days filming a new video with the Truedor team, covering every operation within the factory and then visiting a local customer to get their views on the new composite door they had installed in their home. “I love seeing what type of doors people choose for their homes, the colour especially, and the style. A new door makes such an impact on a house and can transform it completely; it can really set the tone for the rest of the property,” he said. As a seasoned traveller for his successful TV programmes, George gets to see a fair number of doors and in his experience South American homes are where they are used to their max. But not all doors are masterpieces. “One of the weirdest I’ve seen was on an extension built on a 1930s house. Someone had used a period interior door on the outside of the house. It had no weathering and no proper seals,” he added. “George has been great for our business since we first started speaking to him, and he contributes a great deal to the way we think about our door offering. It was great to have him along to make the new video and I know it will be really well received by our customers”. Coming soon - Watch this space for our video interview with George and news updates on our new south Wales factory.